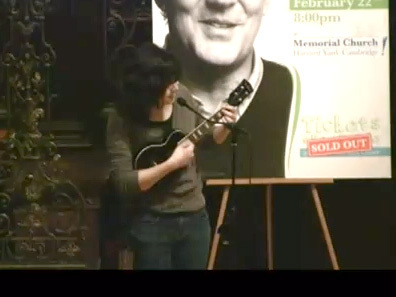 Molly Lewis serenades Stephen Fry on ukulele at Harvard: "Let me have your baby"
(CBS) - Stephen Fry, a notable British actor, comedian, author and journalist, was presented with the 2011 Lifetime Achievement Award from the Humanist Chaplaincy at Harvard University after being chosen for his endeavors in the arts by a group of students. But he ended up getting more than just an award at the event as you'll see in this video - a girl named Molly Lewis decided to serenade Fry with this song entitled "An Open Letter To Stephen Fry." The serenade appeals to Fry to let his DNA continue and let her have his baby - hilarious! The song by musician Molly Lewis is truly catchy and funny, and Fry's reaction at about three minutes and ten seconds into the video is priceless. Across the pond, Fry's acting career spans all mediums and four decades. In the States, he is best known for his roles in such movies as the 2001 comedy "Gosford Park," and the action film "V for Vendetta." He also received wide acclaim for his portrayal of poet Oscar Wilde in the 1997 British film "Wilde."